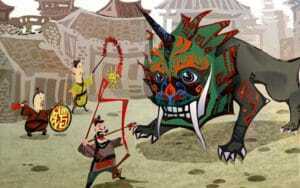 An ancient Chinese legend about the origin of chuxi tells us that there was a monster called Xi. Xi would emerge from the sea on the 30th day of the 12th lunar month to dine on the locals. No one would dare sleep that night until, at last, they learned that the monster could be driven away by putting up red paper and setting off ﬁrecrackers. Since chu means “to get rid of”, the Spring Festival Eve was known as chuxi, meaning “to get rid of something”. The character “福” is often seen pasted upside down during the Spring Festival. Do you know why? After the emperor of the Ming Dynasty, Zhu Yuanzhang, ascended to the throne, he secretly told all the people who had helped him to paste the character “福”, which means good fortune, on their doors. He would then kill those who hadn‘t put the character up by the second day. Aﬂer discovering the plan, the kind-hearted Empress Ma asked every family in the city to paste the character before dawn hence eliminating the disaster. Thankfully the people listened to her. On the second day, when the emperor ordered his soldiers to kill all those who hadn’t pasted the character “福”, he was told every family had pasted the character. This made him very angry. Then the emperor heard about a family had pasted the character upside down because they were illiterate. He became so furious that he immediately ordered the whole family to be executed. Empress Ma then hurriedly explained to the emperor, “The family must have learned Your Majesty will come today, so they put the character “福” upside down”. The clever Empress Ma knew that when spoke in Chinese, “upside down”, has the same meaning as “good fortune has arrived”. The emperor fell for her explanation and didn’t kill the family. A disaster was avoided. From then on, people have put the character “福” upside down, meaning “good fortune has arrived”. What’s on the menu for Chinese New Year? Chinese people attach much importance to family reunion. No matter how far the family members live from each other, they will normally go back home to eat a family reunion dinner on the Spring Festival Eve. The dinner, usually a big feast, includes dumplings and all kinds of other food. In northern China, each dish has a special meaning. The steaming hotpot signiﬁes prosperity. Since fish has the same pronunciation as “surplus” in Chinese, it means “surplus year after year”. Chicken has the same pronunciation of luck, which predicts auspiciousness while carrot heads, also known as caitou, express the wish to have a good luck. Deep-fried food, such as that of lobsters and whole ﬁsh, signiﬁes the auspiciousness of a family. Dumplings, originated from the word “intersection”, which means the moment between the old year and the new year. Since a dumpling also resembles a shoe-shaped gold or silver ingot in ancient China, placing plates of dumplings on the table signiﬁes “the New Year will come with wealth”. Families usually sit around the table on the Spring Festival Eve, eating the reunion dinner while watching the Spring Festival Galat and awaiting the ringing of the New Year bell. The sound of ﬁrecrackers will be heard and spectacular ﬁrework displays seen. On the morning of the ﬁrst day of the ﬁrst lunar month, people put on their ﬁnest clothes and exchange New Year greetings. Elder members of a family give “lucky money” to the children and adults exchange greetings, wishing each other good fortune and a Happy New Year. With the development of communication tools, people send loving text messages to each other. All around there is a bustling and joyous atmosphere. No matter where you are, you’ll surely receive good wishes. Would you like to come to China now and experience it? Chinese New Year, it’s time to sing! “Little kids, little kids, don’t be greedy. On the 23rd, eat glutinous sugar candy. The day before the Spring Festival is known as the Spring Festival Eve, which usually falls on the 30th (although it can sometimes be the 29th) of the 12th lunar month. To usher in the New Year, fun activities such as hanging lanterns, setting off ﬁrecrackers and putting up Spring Festival couplets are held. People oﬂen stay up until midnight on the Spring Festival Eve, otherwise known as Shousui. Chinese New Year 2018….Ready, Steady, Go! What is Spring Festival? Is it the equivalent to Chinese New Year? When is Chinese New Year? Does it occur at the same time of year? How long does Chinese New Year last? How do people celebrate it? If you don’t have the answers to all these questions, then read this article to uncover the truth about the most important and popular event in China. This year, Chinese New Year falls on February 16th, the year of dog. Chinese New Year is also referred to as Spring Festival, due to the prominent arrival of Spring after the New Year. When is the Chinese New Year? Does Chinese New Year fall on the same day every year? Chinese New Year, is the most important traditional festival in China. In terms of grandness and importance, it is the equivalent to how Christmas is celebrated in the West. It falls on the 8th of December in Lunar calendar ( 16 February this year) and lasts for two weeks.The festival comes to a climax on the last day of December in Lunar calendar (commonly known as the Spring Festival Eve or chuxi in Chinese) and on the 1st of January in Lunar month. For Chinese people, no matter where you are, no matter how difficult it is… it is a time to go home. What is your best Chinese New Year memory? Most of the time, I celebrate Chinese new year with my family: we sit and watch the new year gala and cook dumplings together. But in 2013, I started working in Thailand, where I experienced hot tropical weather, a different culture and had no family around. I was a bit sad and missed the Spring Festival’s atmosphere from my hometown. The good thing is that my local Chinese friends suddenly put up a gathering of more than 20 people from all over the world, and we started making dumplings together. So I did not feel lonely any more! We had so much fun and ate all different shapes of dumpling made by all people from different countries. This experience was quite unique to me and I will remember it during my whole life. How do you usually celebrate CNY at your place? I was born in Northern China, in the Hebei province. Northern Chinese love food made with wheat flour, like dumplings, noodles, steaming buns etc. And Northern Chinese take this Spring Festival celebration really seriously. It can last for a month. In my family, on the 24th of December of the lunar calendar, my family is getting ready for New year. We sweep the whole house, including the roof, and every corner in every room. We really want to make sure that our house is spotless before Chinese new year’s eve . When I was young, my family used to buy live Chicken and fish to be cooked for the new year feast. On the 25th, we usually buy Tofu and we fry it. On the 26th, we buy a lot of meat and stew then put salt on the meat to keep it longer. On the 27th of the Lunar calendar, it’s time to kill the Chicken. I always used to hide away from this event. The only memory I have is the chicken feathers floating around the yard. Four days before the new year’s eve, the cooking show was ready to start. Now we don’t buy live Chicken anymore, but I always remember this scary yet exciting feeling from my childhood. What are your favourite dishes for New Year? There is a lot of food you can eat during Chinese new year, but two dishes are my favourites. We call them “Niangao” and “xioamihuangzi”. Niangao is made of sticky rice with Chinese date, and “xiaomihuangzi” is made of millet flour. They are not fancy food, on the contrary, they are quite cheap to make. But for me they are really related to Chinese New year and to my my grandmother who cooks very well. Which expression with your teach your students for CNY? These two sentences both contain a similar animal sound. “Ji Xiang” means auspicious, but “Ji itself” means Chicken. As this year is the year of the Chicken, it means a lot. “You yu” means “to save more”, and “yu” also means fish. It means that, by the end of a year, you will get money and wealth. What is your best CNY memory? I remember when I was a child, it always used to snow during CNY. It was white everywhere. My old house has a yard. We used to hang red lanterns under the roof. It was so beautiful, especially when the lanterns were covered with a thick layer of snow. The red lanterns and white snow just matched with each other so well! I will always keep this scene in my mind! I live in the Hebei province. In my hometown, our family always meet on the New Year’s Eve and we usually have a big meal! During the meal, 饺子 (dumplings) are essential! Our whole family will make dumplings together. As an old tradition, we’ll put coins, dates, or other sweet desserts inside some of the dumplings – it’s said whoever gets the special dumplings will have good luck in the next year. Besides, the whole family will be staying up until midnight. When the clock points to twelve o’clock, we go out and set fireworks to celebrate New Year. The next day, we will all wear new clothes and shoes and visit our relatives and neighbors for new year greetings. What are your favorite CNY Eve dishes? What is the sentence in Chinese you will teach your VivaLing students for Chinese New Year? I want to teach my Vivaling students 过年好 (guo nian hao) for the CNY greetings.